I stumbled across this book by unfortunately watching it's film adaptation first which although is a really brilliant film, meant that I knew the whole plot before I turned the first page. However the film was so intriguing I couldn't resist. This is the debut novel of Diane Setterfield - and it's a very powerful debut most authors could only dream of. It's a very promising start, she has gone on to write another book titled - Bellman & Black, which is described as a dark atmospheric ghost story that gives The Thirteenth Tale a run for its money. The Thirteenth tale centres around the life of a fictional novelist, Vida Winter who has always remained elusive until she is struck down by a terminal illness. She enlists the help of a amateur biographer, Margaret Lea, by summoning her to write her biography and learn all her secrets. To familiarise herself with Vida Winter's work she reads her - Thirteen Tales of Change and Desperation. 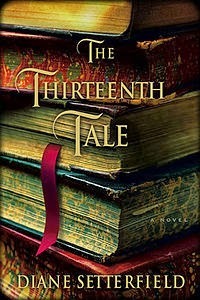 She finds herself drawn in and becomes desperate to find out the thirteenth tale which is strangely absent. The style of writing is beautifully gothic and atmospheric, the standard of which many writers dream of achieving but never realising. I still can't believe this is a debut novel, by the time I had read to page 50 I had already bought her second book - Bellman & Black, adding to my ever expanding to be read pile which is seriously beginning to get out of hand. I found the character of Margaret Lea fascinating. She seems trapped by her love of books rather than liberated. The author does not disclose her age she is described in a way that suggests she is middle aged but I had a suspicion she may well be younger than that. She seems very lonely still mourning the loss of her twin who died at birth, she has never married or had children, much like Vida Winter. But these two characters are utterly different.Vida Winter seems to have led a very interesting life but claims that she is nothing and her books were only written in order to fill the void. On the other hand the lives of the Angelfields seems monstrous and haunted by tragedy, they are aristocratic but barbarians, beautiful but savage. They live by no rules and in a sense they are free, free from society but also trapped within the confines of Angelfield House. Isabelle tries to leave on a few occasions but she is always drawn back. It's a book that you want to take your time with and read slowly to savour every word much like dining out at a fancy restaurant. This book was constantly by my side and I found it irresistible to put down much to the annoyance of others. There is a tension that builds up throughout the novel, you get a sense that Margaret is trapped and needs to break out of her boring inhibited lfe, but will she? You also get the sense that something terrible will happen the Angelfields afterall it seems to run in the family, And what happened to the twins? How did the fire start? The story is haunted by many ghosts both dead and living. Margaret seems a ghost moving through life invisible to others, Vida Winters is about to be a ghost. I wonder what are her motivations for revealing all to Lea? Is it penance, atonement, confessional? Is she telling the truth or just having a last laugh. She speaks of being haunted by a girl with red hair and green eyes, is this her twin and does she owe her dead sister something? Dianne Setterfield is a natural when it comes to creating both suspense and mystery. She raises many questions and does not fail to answer every one. The ending was really satisfying and moving. Overall the book is beautifully written and never fails to hold a readers' attention. You're seriously missing out if you don't read this book.